Well what king of training is THAT? Sounds like a bad date I had once. Wow, the Bat got totally gypped. Wow! Batman has muscles were us mere mortals do not! Yah, what’s that one shaped like a hamburger where we have abs called? I always thought Batman went to Wayne State University. @Gero: It’s called the meaty muscle! Only two beings have muscles like that and one of them is Chuck Norris. 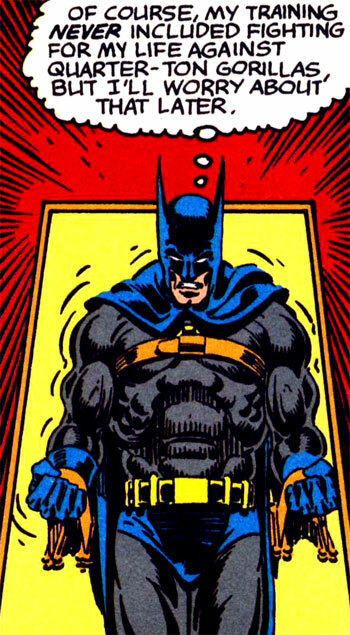 It looks like Batman’s chest is trying to swallow his abdomen. His body muscles look like a face. His pecs are the eyes,(with a yellow visor over them) inbetween and below them is a nose with a mustache below that, followed by a mouth, then a chin.